If you need a pool cleaning service company in Clearwater, Triangle Pool Service has you covered. We have been providing our exceptional services to clients in St Pete, Largo, Seminole, and Pinellas County since 1959. Our staff specializes in both residential and commercial properties and strive to make sure we exceed every customer’s expectations. We understand how important it is to keep up with the proper maintenance of your swimming pool. However, we also know that it is not the easiest job to do. From chemicals, to pH levels, to chlorination and filtration, the entire process can quickly seem like a hassle. At Triangle, we will take care of all of this for you, so the only thing left for you to do is enjoy your luxurious home amenity! For residential homes, we offer weekly maintenance for pool cleaning in Clearwater and Pinellas County so you can guarantee that your water oasis is always in the best condition possible. It takes both knowledge and experience to keep your swimming water clean and crystal clear. 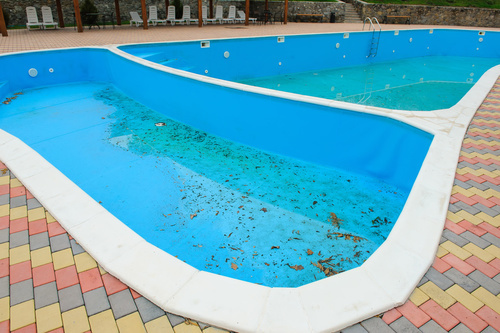 By utilizing the services we offer here at Triangle, you will be removing any doubt you may have in your mind that your pool is does not have proper maintenance. If you’re lucky enough to own a pool, it would be a shame to let it go to waste. When we come to your home, not only will we clean but we will also do water testing, vacuuming, skimming, and tile and filter cleaning as we see necessary. You will feel proud to invite guests over to entertain them and enjoy the beautiful Florida weather. If you want to take advantage of our pool cleaning service in Clearwater and Pinellas County, we offer flat rate services. Plus, we will come to your home as often as 3 times per week! We also offer our services to apartments, condos, hotels, clubs, property management companies, resorts—no property is too big or too small! If you don’t hire professionals for proper pool maintenance, you run the risk of letting the water become unhealthy. (Not to mention the huge waste of not being able to utilize such an amazing home amenity!) Imagine how unfortunate it would be to see your water cloud and become discolored and/or murky. With algae and substance build up, your skin can quickly become irritated. But at Triangle we make sure that will not happen. Our staff has training, skills, and experience in this industry and we genuinely care about each and every client we have. We guarantee that you will always feel like your pool is being taken care of by skilled professionals and are not over-charging you for service. Our team will work with you to make sure you’re receiving the quality service that you deserve. We’ll work around your specific needs and schedule so that our presence is never an inconvenience. Triangle is also licensed and insured (LIC# RP 0058712). Do not trust any random company you come across in the phone book. We offer quality service at an affordable price. Our other services include storm damage clean up, insurance claims, special clean-ups, acid washing, and more. For more information about our swimming pool cleaning service company in Clearwater, St Pete, Largo, Seminole, or surrounding areas of Pinellas County, or to learn more about our other services, call us today (727) 531-0473.